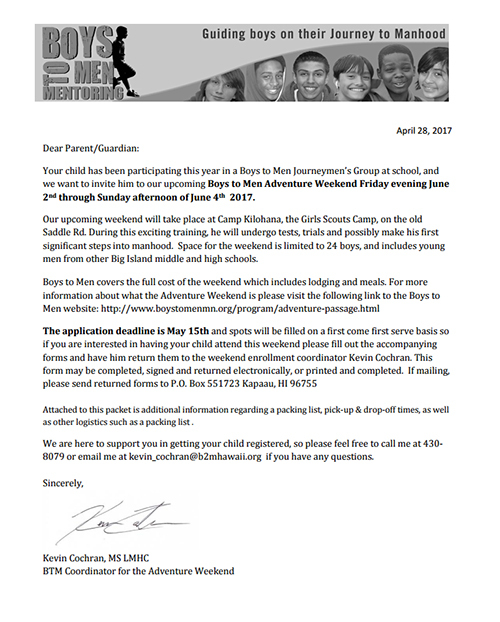 The Boys to Men Hawaii Adventure Weekend is a unique opportunity for boys age 14-17. During our Adventure Weekend boys are joined by our experienced mentors and are challenged to face the struggles of their day-to-day lives head-on. The boys in our program are called “journeymen” since for many of them, the Adventure Weekend signifies their first step on a path towards building a foundation of compassion, respect, and accountability so that they are able to embark on a positive journey towards manhood. A good role model makes all the difference! Boys to Men mentors provide unconditional support while encouraging the boys to both listen and share, to learn from and accept one another. The Boys to Men Hawaii Adventure Weekend invites boys to face themselves during a particularly critical time in their lives, when dropping out of school or succumbing to addiction and violence is most prevalent. Our Adventure Weekend is designed to empower young men through fun, team building activities that also encourage the formation of a community, one that is built on acceptance and love instead of fear and judgment. Each boy confronts his issues at home or at school in a safe environment surrounded by peers and role models invested in his success. The experience is truly priceless, both for our mentors and our boys, who learn about themselves and about the men they want to become. The weekend provides many boys with the confidence and the tools to begin a positive journey towards manhood. Every journey towards manhood is unique but every individual journey should be filled with encouragement, compassion, and understanding. During our Adventure Weekend the boys in our program are given leadership opportunities that teach them courage: courage to stand up for what’s right, courage to face their challenges, and courage to grow into the good and strong men of tomorrow. 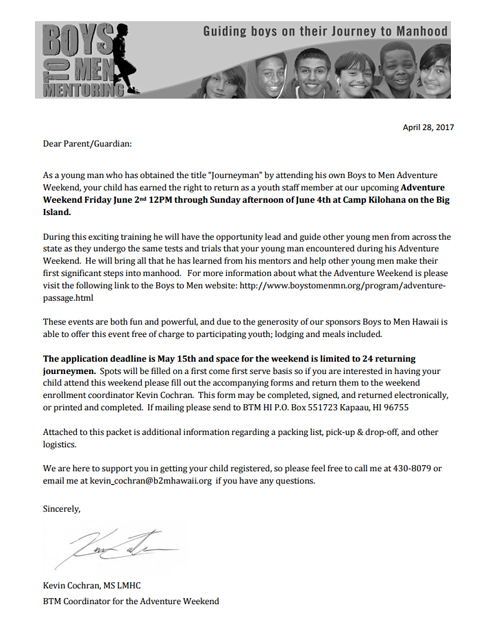 Print and sign the permission waver to have your son join our Adventure Weekend and take his first step towards manhood.